According to the Kiosk and Retail Report, the size of the U.S. interactive kiosk industry grew at an average of 10.36 percent between 2013 and 2016—from $533.37 million to $716.97 million. According to the same report, the industry will reach $1 billion by 2021. According to a survey conducted by TSYS, 75 percent of the respondents preferred to use credit or debit cards and only 11 percent preferred cash. With the use of card-based payment, including mobile wallets, on the rise in the U.S., unattended kiosks or vending machines that don’t accept all forms of card-based payments are at a disadvantage. A recent USA Technologies investor presentation discusses the market sizing for vending and kiosks. According to the data in the presentation, there are about 15 million self-service points in the U.S. including vending machines, parking meters, kiosk, laundry, etc. Out of these, 7 million can benefit from accepting cashless payments, but only 2 million are currently enabled. And of those 2 million enabled only a small percentage are EMV and P2PE capable. This leaves a large opportunity to not only enable cashless payments at the 5 million unattended points unserved today but also upgrade the existing cashless systems to EMV and a higher level of security. Today, consumers are paying with credit cards and mobile wallets at parking meters, vending machines, pharmacy pickup windows and many other locations. As a result, they will soon begin to expect the same convenience of these multiple payment options at every opportunity. This means businesses should upgrade their unattended payment technologies to align with current payment standards and consumer demands. 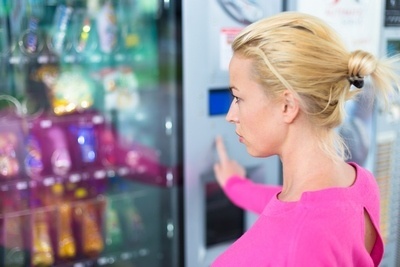 However, before upgrading your kiosk or vending machine, it’s critical to make sure you’re incorporating all the necessary components, features, and capabilities to future-proof your payment infrastructure. It is critical for businesses to implement a secure payment acceptance system. Unattended solutions, though useful, are also easy targets for cyber criminals to infiltrate and steal credit card data. Vending machines that sell big-ticket items such as tablets, mobile accessories, smartphones and pharmaceutical products are the most vulnerable in these situations. Consider adding additional payment security measures such as point-to-point encryption (P2PE) and tokenization. P2PE helps protect card data from cybercriminals as it travels from the point of payment through authorization, and tokenization helps protect card data while it’s stored in back-end systems. You should also make sure your unattended payment solution is PCI PTS certified, which helps protect your payment infrastructure against physical, logical and network tampering attacks. EMV is a global payment acceptance standard, and U.S. merchants are required to accept chip cards to avoid bearing liability for chargebacks due to card fraud. This also applies to unattended environments such as vending machines, kiosks, and other forms of self-service. Consumers are becoming accustomed to using EMV cards everywhere they shop, and they understand its security benefits. Soon, they will start expecting the same experience when checking out at a kiosk, vending machine, or other self-service payment devices. Business owners who have invested in unattended payment solutions should upgrade their technology to accept EMV chip cards for the same reasons merchants upgrade their attended solutions—to guard against credit card fraud. Near-field communication (NFC) technology has taken off in the U.S. with mobile wallets such as Apple Pay, Google Pay and Samsung Pay. In fact, a recent study by First Annapolis Consulting found that 85 percent of U.S. consumers under 35 years of age and 36 percent of those over 65 made a payment using a mobile wallet in the past 12 months. Mobile wallets are expected to bring about a behavioral change among consumers and help drive more people to use their smartphones to pay for goods and services. By upgrading your unattended payment solutions to accept NFC payments, you can keep up with consumer demand and the evolving payment landscape. When it comes to payment acceptance, providing the customer with more payment choices goes a long way toward creating customer loyalty. One way to do this is by enabling the use of gift cards and store credit cards for unattended payment solutions. Also known as closed-loop cards, typically these payment cards can only be used at a specific merchant or location. Accepting them in unattended payment environments provides customers with the option to use them even when they’re not interacting with a store employee or at the standard checkout counter. This encourages greater impulse purchases and allows consumers to leverage the merchant’s loyalty programs to receive rewards, offers and discounts on an ongoing basis. By enabling closed-looped card acceptance in these unattended environments, you can help strengthen customer loyalty and increase repeat business. Payment solution integration can be tricky and complex when it comes to unattended solutions. Whether it is a vending machine, ticketing kiosk, retail pharmacy dispenser or parking meter, any payment integration involves many different technologies and often many different players. For example, a retail kiosk may include components or services from an enclosure or kiosk provider, a payment acceptance provider, software developer, system integrator, value-added service provider, gateway provider and more. System integrators or value-added resellers (VARs) are typically the ones that bring all individual elements together to form a complete solution. Ultimately, the solution must meet the unique business needs of specific merchants, industries and market segments. Thus, it’s imperative for unattended payment solutions to be easy to integrate with and fit seamlessly into whatever environment the solution is being designed to address. Vending machines, kiosks, and other unattended solutions have built-in software that enables their payment technology to function. Like most other software, these applications need to be updated regularly as well. Kiosk or vending solutions can fail to work properly if not updated promptly and can post as a major security risk for the customer’s card data. This in turn can be a big inconvenience that deters repeat purchases. To address this issue, look for a solution that leverages estate management software, allowing you to perform updates or adjust configurations to the payment device remotely and without having to schedule a visit from a technician. Unattended payment solutions go through a lot of wear and tear. Thousands of people use these self-service technologies on a regular basis. Some solutions, such as outdoor parking systems or ticketing kiosks, are also exposed to weather elements that can potentially damage the machines. It’s important to have a robust and durable solution that can withstand these conditions by meeting standards for ingress protection (guarding against environmental elements such as water, dust, etc.) and shock (impact/ force) protection. As consumers become more comfortable with new technology, they expect payment options that align with their individual purchasing preferences. As the kiosk market reaches $1.07 billion by 2021 and encompasses many applications and industries, it will be imperative for businesses to keep up. Forward-thinking businesses will need to provide customers with a fast, unattended, convenient and secure way to pay that enhances their overall purchasing experience. To learn more about how you can get started, check out our unattended partner program.